Husqvarna is a legendary company, which has bee around for centuries - literally. Founded in the 1600’s in Sweden, the original company made flintlock rifles. Over the years the product line has expanded to include lawnmowers, motorcycles, and chainsaws. The Husqvarna line has maintained the distinctive orange color and Swedish styling, even though the machines are built in the USA. For a time, the Husqvarna company was run by Electrolux, the super-sized company tha makes wonderful kitchen appliances. Husqvarna once agin became an independent company several years ago, with a full line of yard and garden products. Husqvarna ZTR has a strong product line for the homeowner, when price is a big consideration. They also make a fine line of commercial ZTR mowers for those with deeper pockets and larger yards. All the Husqvarna ZTR mowers feature side discharge. The deck cutting height is adjusted manually using a lever. All of the mowers feature an electric starter to get the engine going. The frames on all the Husqvarna ZTR models is fully welded steel ( no bolts and nuts to come loose, compromising the frame strength). Husqvarna ZTR mowers are available in 2 model series - the Homeowner (Less expensive, lighter duty) and the Landowner (more features, heavy duty). The Landowner models are more expensive, and are equipped with heavy duty engines and more sturdy transmissions. There are four Homeowner models available, and three models in the Landowner series. Husqvarna has recently decreased the number of models offered in both series. The Homeowner series offers a choice between a single cylinder overhead valve (OHV) Briggs and Stratton 16.5 or 19 HP engine, or a Kohler twin cylinder 24HP engine. Drive wheels are powered by the standard dual Hydro-Gear EZT units. The lap bars controlling speed and direction are padded. The Homeowner series ZTR mowers have either a manual or electric PTO to engage the cutting blades ( model RZ 3016 is the only mower with a manual PTO). The cutting deck is fabricated out of stamped steel on all the Homeowner models. Adjusting the deck height is accomplished by a multi-position hand lever. Model RZ 3016 comes with a 30” single blade cutting deck, and is powered by the lower 16.5 single cylinder engine. This is the newest ( and lowest priced) ZTR offered by Husqvarna, and is aimed at the entry level consumer. Look for this to be sold through Sears, as well as dedicated dealers. The price is hard to beat at around $2200.00, but look for seasonal discounts. Model RZ 4219F has a 2 blade 42” stamped steel cutting deck, with the 19 HP Briggs and Stratton OHV single cylinder engine providing the power. The transmission is the standard Hydro-Gear EZT, which is found on most ZTR mowers that are not built for professional use. The PTO has been upgraded to an electric engagement instead of manual. Plan on spending about $3,000.00 for this nice homeowner ZTR mower that is above entry-level quality. To continue the trend, RZ 4619 is also powered by the 19 HP Briggs and Stratton OHV single cylinder engine. The deck width has been increased to 46”, and is stamped steel with 2 cutting blades. Hydro-Gear EZT transmissions power the rear wheels. The PTO engagement in electric. One criticism of this machine is the engine size. Using the 19 HP engine to power a 46” cutting deck might be reducing any margin for error in a ZTR mower. This may not be suitable for yards that feature hilly terrain, or for mowing grass that is frequently overgrown or wet. The RZ 4619 has a list price of about $2500.00. 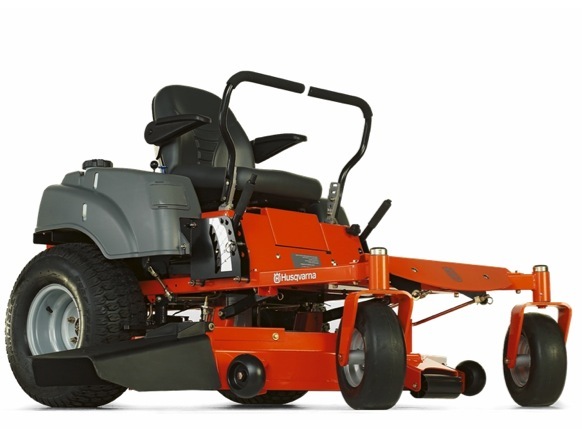 The largest mower offered in the Homeowner line is Husqvarna ZTR model RZ 5424. This mower leaves an impressive 54” swath of freshly mown grass in its wake, thanks to the 3 blade stamped steel cutting deck. A more than adequate 24 HP Kohler twin cylinder engine gives all the power one could ask for - this engine is also seen on many professional grade machines. The transmissions remain the Hydo-Gear EZT seen on the lower priced models. Blade engagement is from the electric PTO. The top of the line homeowner machine lists for a modest $3000.00, making it the best value in the lineup. Somewhere between the Homeowner models and the truly professional machines is where the Landowner series resides. The two higher priced Landowner models have more features. Here the choice is between either a 26 HP twin cylinder overhead valve (OHV) Briggs and Stratton heavy duty engine, or a Kohler 24 HP twin cylinder OHV engine. Both versions of the engine feature a pressurized oil system, with a replaceable oil filter. The lap bars controlling speed and direction are padded and adjustable. Both of the Landowner ZTR mowers come equipped with a stamped steel 52” cutting deck with three cutting blades. So what is the difference between the two models? There are engine and transmission options to let you decide how close to a professional grade machine you would like to be. Model EZ 5224 is powered by the 24 horsepower twin cylinder Kohler engine. The transmission has been upgraded to twin Hydro-Gear ZT 2800 units. The seat is high back design, with adjustable arm rests. This is one sweet machine, and lists for about $4500.00. Need even more power and features? Check out model MZ 5226 with the 26HP Briggs and Stratton twin cylinder overhead valve (OHV) engine. The transmission is a professional grade Kanzaki pumps with Parker TJ wheel motors. No one offers a better transmission than this winning combination. Throw the control levers forwards, and hold on to your hat - this baby is going to move! The seat is ergonomic and fully adjustable, with arm rests. The PTO is electric ( of course). The classic Husqvarna ZTR styling comes free at no extra charge. The price for this ‘terminator of the turf’ is about $5800.00. Most customers that purchase one of the well built Husqvarna ZTR lawn mowers would buy another in the future, based on high satisfaction. If price is your number one concern, be sure to shop at Sears for possible discount pricing on these mowers. Otherwise, try to find an independent dealer in your area for top-notch support and repair.